I have this fascinating friend named Mike. He’s done quite a few interesting things in his life: bass player for a Grammy winning artist, handy man extraordinaire, one-true-love to a 96 year old Cuban woman. His next interesting venture: moving to Nebraska. He must have a job offer out there? Nope. Well, then family? Not one. Then….why is he moving to Nebraska? The better question, I say, is: Why not Nebraska? It’s a perfectly wonderful place to live. I do predict that Mike and his super adorable wife are going to love the mid-west. They will “Win” at Nebraska. And those two California natives will freeze. Their. Asses. Off. 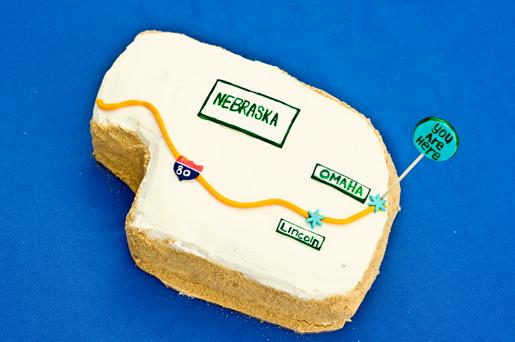 Obviously this cake is in the shape of Nebraska, but there is a little more of that corn husker state in there than meets the eye. I made it with Nebraska’s own Black Betty Imperial Stout. Black Betty is still a smaller craft brew so if you aren’t able to find it, use a dark beer or a chocolate stout. First, preheat the oven to 350, and then combine flour, salt, baking powder, baking soda and the cocoa powder in a bowl and whisk until well combined. In the bowl of a stand mixer add the butter and sugar and cream until well combined. Add the eggs one at a time, beating well after each egg. In a microwave safe bowl, put the 72% chocolate. Microwave for 30 seconds, remove and stir. Repeat until the chocolate is melted. Add the melted chocolate to the sugar/egg mixture and blend well. While the mixer is on a medium-low setting, add the stout and then the coffee, continue to combine until well mixed, then add the flour mixture a little at a time until well combined. Grease and flour the cake pans that you are using. I used two 9×13 inch sheet pans. Bake for between 25 and 35 minutes (depending on your cake pan size) or until the cake is set in the center. Remove from oven and allow to cool. Place chocolate chips in a heat safe bowl. 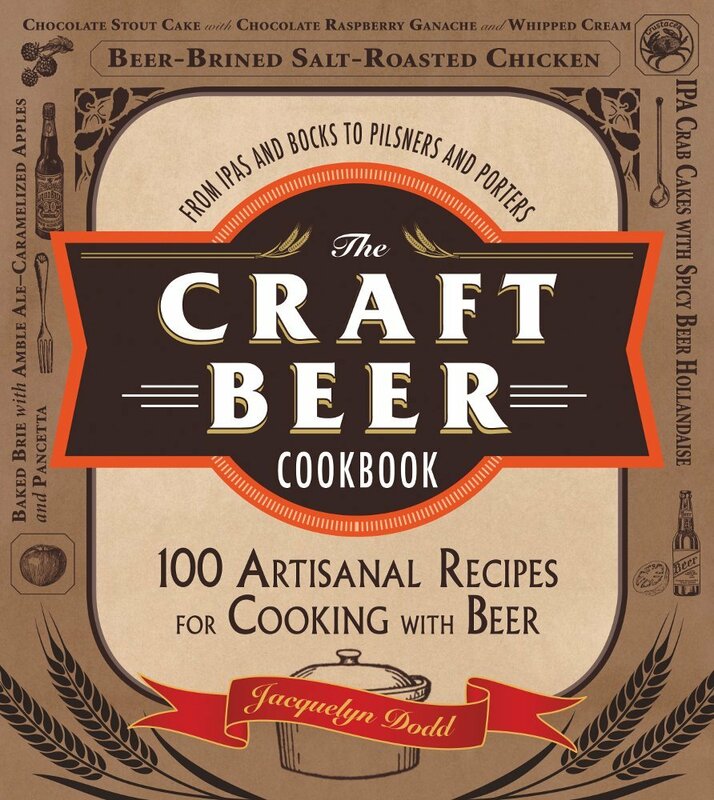 In a pot on the stove, add the 2 cups of beer and cook over medium heat until reduced by half, stirring frequently, about 10 minutes. Pour the beer, that you have reduced to 1 cup, over the chocolate chips and stir until well combined. Place in the fridge and allow to cool completely about 30 minutes. Place all the icing ingredients in the bowl of a stand mixer and beat on high until well combined and creamy. You really, really need softened butter and softened cream cheese. If either of those are cold, your frosting will have lumps in it. I used this on the outside of the cake, but it’s optional. Just place all the crust ingredients in your food processor and process until all combined. On your bottom layer of cake, put a rim of frosting around the edge, that’ll make it easier to keep the ganache in the center. Add the ganache to the center of your frosting ring and allow to spread out evenly over the layer. If your ganache was warm at all, it would be a good idea to place the cake in the fridge at this point to allow to cool before proceeding. Top with the second cake layer, then add the first layer of frosting to your cake with the piping bag and smooth out with an off set spatula. Some people call this a crumb coat, because crumbs will invade this layer. I call it the dirty ice, because it sounds more fun. Place the cake in the fridge and allow the first ice to set, about 1 hour. Once you are ready for your final icing, use an off-set spatula and try to make it as smooth as possible. Before the final frosting layer has set, add the crust to just the sides with your hands, using as much as will stick to the sides. Allow the final ice to set before decorating as you wish. What a sweet cake to make for your friend! If I agree to move to Nebraska, will you send me one, too? It looks fabulous! Your blog and recipes are gorgeous!! Michael and I thank you from the bottom of our hearts for this delicious labor of love. Just a heads up…it taste just as good as it looks.